Last time, we looked at the intention of redemption. The first and, perhaps, most beautiful aspect of redemption's invitation is the intent of both the giver and the receiver. The offer Hosea made to Gomer was predicated on the intention that He would once again be her husband and she would accept his invitation through fidelity to their relationship. (See Hosea 3:3.) We must do the same. 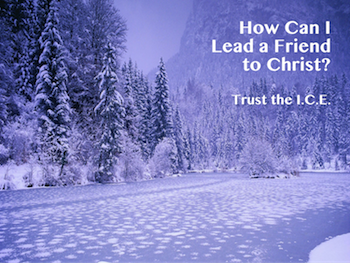 The second facet of the biblical invitation is dimension. I remember the day I first discovered that a store-bought 2" x 4" really doesn’t measure 2 inches by 4 inches at all. I felt a little cheated. The actual measurement is 1.5 inches by 3.5 inches. Yes, I'm sure there is a perfectly good reason why a 1.5" x 3.5" is called a 2" x 4", but to me it just seems a little misleading. Thankfully, our Creator is not that way. He understands our need for clearly defined parameters. Unlike the Calvinistic doctrine of "Unconditional Election" which really leads to "Uncertain Election" (see "Questions for Calvin: U is for Unconditional Election"), the Bible tells us we can "know" that we have eternal life (1 John 5:13). Redemption's dimensions have been clearly established and communicated by God. Notice once again the powerful illustration God gave in order to define biblical redemption. From the story of Hosea and Gomer we can clearly see the two sides of redemption's dimensions. Please notice that Hosea wanted far more than just a bill of sale, he wanted a full restoration of relationship with Gomer. Did he own her? Absolutely! Was his ownership enough to satisfy the illustration of God? Absolutely not! For redemption to be complete, Hosea needed Gomer to respond appropriately. He had paid the price, but until Gomer chose to return to him in full fidelity she would only be a possession. The cleansing of the relationship would not be complete. As we pedal forward to the church age, we find that God's parameters of redemption have not changed. "By this gospel you are saved, if you hold firmly to the word I preached to you. Otherwise, you have believed in vain." The word "gospel" encapsulates the good news announcement that the price has been paid. But notice, there is more. The response to that payment is also redemptive in nature. Notice also the sad results of a redemption process that ends too early and neglects the human side of redemption's dimensions (response) - "you have believed in vain." Even though the price had been paid, the appropriate response of fidelity ("hold firmly") was not made and, as a result, belief was in vain. Hell will be full of those who foolishly assumed that payment was the entirety of the redemption process. 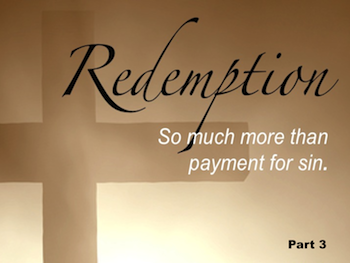 Can you see the parameters of redemption - His payment x our response? The second aspect of redemption's invitation eliminates the mystery. Clearly defined parameters help us understand both what God has done and what He expects us to do in response. The offer Hosea made to Gomer was far more than just an invitation to be owned, he also wanted her to make the free-will choice to embrace a full restoration of relationship. We must do the same. The payment has been made. The payment is enough. It's not the payment that is in question. Our response to Christ's offer is the only variable. We must complete redemption's dimensions. We must make it real! Redemption - Part 4: "Retention"